With thousands of shows and millions of fans, the Supertones are one of the most treasured gems in Christian rock with every record becoming an instant classic. The O.C. Supertones Ultimate Collection spans the ten years of the band's existence, featuring the singles that rocketed them to stardom as well as the album tracks that have become fan classics. This 2-CD set is a must-own piece of music history leaving no rock unturned in the Supertones' music catalogue. 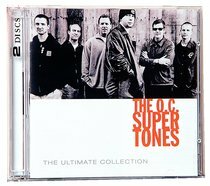 About "Ultimate Collection: Oc Supertones"